Although catastrophic anthropogenic global warming (CAGW) is erroneously alluded to as a culprit that will lead to a colder climate for Britain, the bulk of the information presented is actually very relevant. It's been widely publicized that rapid climate reaction to AMOC collapse (or slowdown to a critical level) is well researched and relatively quite solidly supported by the research. The problem is, it's been very closely tied to CAGW so it actually tends to be left out of the GSM conversation as a result. A recent (2017) paper addressing the AMOC slowdown problem, when properly tied to the documentary above, and to GSM weather patterns, helps to explain why a Grand Solar Minimum is more impactful in the Northern Hemisphere than in the Southern. "Thornalley’s record, which spans those 1,600 years, suggests it started at the end of the little ice age, a period from about A.D. 1350 to 1850, when solar and volcanic influences depressed temperatures across the Northern Hemisphere and glaciers and ice sheets expanded. As the little ice age ended and temperatures warmed, ice melted and freshwater flooded into the North Atlantic. The results suggest the current state of the AMOC is the weakest it has been over that whole long record." "Already, Thornalley says, it is clear the Gulf of Maine has its warmest temperatures in the last 1,600 years." "The researchers are curious why climate models seem to be missing something in the AMOC process. They do not capture this past behavior and significant weakening. If the results of these studies bear out, Delworth says, it is possible the models are not sensitive enough to the changes in ocean freshwater that are happening or they are not factoring in all of the important changes that have impacted the circulation. A 2017 study that looked at what would happen if climate models did factor in that melt saw it caused a sharper response from the AMOC than had otherwise been suggested. The greater cause for concern would be if models are incorrectly capturing the sensitivity of the system, Delworth says, because it means scientist have been underestimating how quickly the AMOC might respond. “It really depends on why the models don’t match the paleo results,” he says. While modelers work to figure that out, Thornalley and others are trying to expand the paleoclimate record to see if the pattern they found shows up at other sites throughout the Atlantic and if they can extend it farther back in time. They are also looking for signs of how much freshwater may have triggered the weakening at the end of the little ice age. Moving forward, the RAPID instruments will slowly help tease out the AMOC’s behavior. “It’s just that we have to wait a couple of years,” Caesar says, by which time some impacts may already be happening." Warming due to a Grand Solar Maximum (not CO2) is part of the process involving the Gulf Stream conveyor. A Grand Solar Minimum following soon after, seals the deal when a more meridional polar jet stream pattern takes hold. The effect that the combination produces also contributes to the prevalence of frigid Winter temperatures in North America...specifically East of the Rocky Mountains. In the case of the AMOC, the rise out of GSMin to GSMax as natural, cyclical global warming tips the AMOC into a significant slowdown in a way that creates the greater cold havoc in the Northern Hemisphere. The meridional jet stream pattern sets up during GSMin with atmospheric coupling to the Northern near-polar region of Gulf Stream weakness helping to form the Greenland Block and topography of the Rocky Mountains combines with Gulf of Alaska/Bering Sea blocking to bring about a "perfect fit" that brings Arctic air down into both North America and all of Western Europe. The documentary was made before anyone knew that a warming "pause" began in 1997 and is now a downturn in global temps. 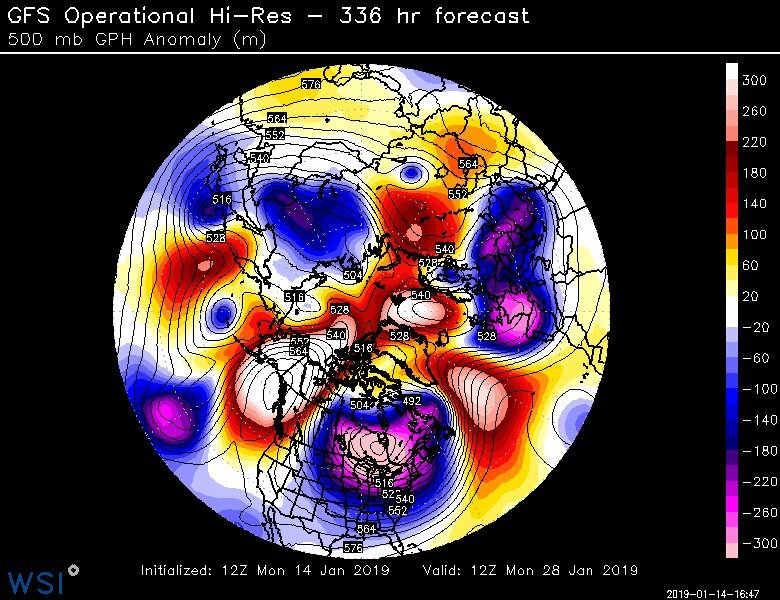 The jet stream is already exhibiting the meridional pattern and there's some serious cold on the way to North America and Europe in the coming months.